Community land rights are the focus of two new initiatives. The first, launched with an 'action shop' in Kenya, enables civil society organisations to share knowledge and chart new paths; the second supports communities to seek legal redress for violated rights. It is an exciting time to be working with civil society groups on land rights issues. In February an ambitious knowledge-exchange programme – led by the International Land Coalition (ILC), Namati and IIED – was launched with an eight-day event in Kenya. The Community Land Initiative seeks to facilitate an international exchange of knowledge on community-level work to enhance land rights. To avoid replicating the classic 'talk-shop' format, Namati's senior advisor Rachael Knight dreamt up an event based on democratic knowledge sharing and collaboration – I'm calling it an 'action shop'. With Knight's energetic facilitation, civil society organisations (CSOs) from Peru, Ecuador, Cameroon, Tanzania and Indonesia co-designed and co-facilitated the eight-day event. Each organisation detailed their work on community-led land protection and, in turn, soaked up wisdom from other CSOs' experiences. The learning curriculum was entirely based on the knowledge and burning questions of the participants – everyone a teacher and a student at the same time; continually challenging each other by asking 'what works?'. In one session, Miguel Macedo and Kathrin Hopfgartner of Peru's Instituto de Bien Común (IBC) described how they collaborated with indigenous communities in the Amazon to develop 'life plans'. These community-level sustainable development plans integrate the social, cultural, economic, political and territorial aspects of community land governance. Additionally, IBC has been mapping indigenous community territories since 1998 and assisting communities in securing community land titles for their territories. Today IBC has the most extensive land registry in Peru, even beyond that of the government. Kathrin explained: "If you want to know where Peru's mining concessions are found, you can download the permits online for free from the government. If you want to know where communities live, there is nothing." 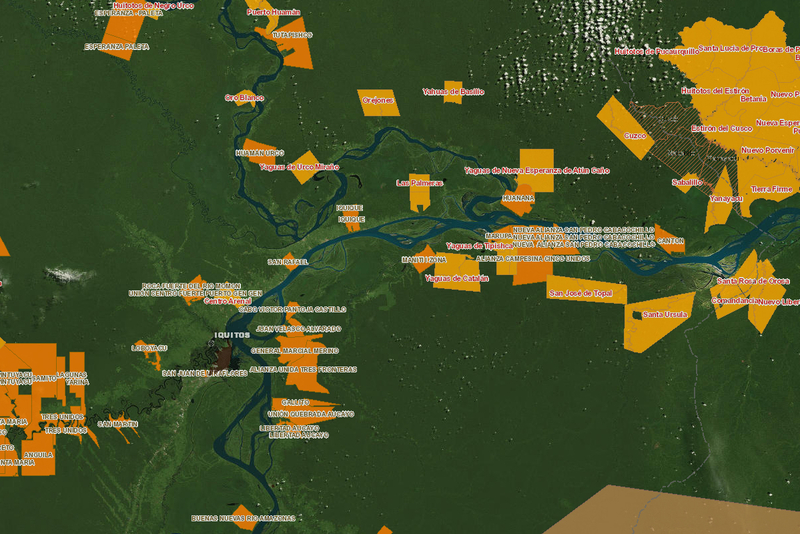 But thanks to IBC and other groups, most of the Amazon's indigenous territories have now been mapped and catalogued. New scientific research supports the ecological benefits of IBC's community-driven approach, finding that in the Amazon, "[community land] titling reduces [forest] clearing by more than three-quarters and forest disturbance by roughly two-thirds in a two-year window spanning the year title is awarded and the year afterward." At a time when conservation groups are regularly accused of violating the rights of indigenous communities, IBC's work offers a model of locally-driven land tenure-sensitive conservation that could be replicated elsewhere. In the final two days of the meeting, participants applied the knowledge they had acquired over the week to develop their own action plans. Each plan will test new tools for securing community-led land tenure, proving the practical power of this dialogue-to-action event format. Digna Irafay and Masalu Luhula, of the Tanzania Natural Resources Forum (TNRF), plan to pilot IBC's life-planning method in two rural communities over the next 11 months in addition to testing some of Namati's land protection tools; Miguel, Kathrin and Rachael will provide peer-to-peer mentoring throughout the year. TNRF and other organisations involved in the Community Land Initiative are blogging about their experiences, including the diaries from knowledge to action of TNRF in Tanzania, the Community Assistance in Development in Cameroon, and the Indonesia Community Mapping Network. The solidarity generated by and among the inspiring participants of the 'action shop' left me with the impression that we are all connected to a new land rights family. During the Kenyan event, I shared experiences about how communities and CSOs can engage with private investors to protect community lands and even secure benefits from private investment. The participants discussed how communities can engage with complaint mechanisms and the law to seek remedy when investors and/or governments violate their rights. This took me back to 2017, when IIED and the Global Legal Action Network (GLAN) brought together legal practitioners to brainstorm how transnational legal accountability might be improved. At that event, we asked 'why are there so few legal complaints to protect community land rights at a time when land rights violations are so widespread?'. There are numerous factors that hamper communities' use of legal redress, including the cost of legal assistance, intimidation of would-be plaintiffs, procedural barriers, low awareness of redress mechanisms, and difficulty navigating the more complex procedures. Resolving the latter two issues could be straightforward and low cost. I'm pleased to announce that IIED is working with ILC to pilot a land rights redress initiative: teaming up with ILC's vast membership and IIED's partners around the globe, we will spread the word about the availability of legal redress mechanisms while consolidating a network of land rights legal professionals that will provide pro-bono advice to community advocates on pursuing legal redress. Watch the IIED legal tools page for developments. Brendan Schwartz (brendan.schwartz@iied.org) is a senior researcher in IIED's Natural Resources research group. The five organisations involved in the Community Land Initiative are Instituto de Bien Commún (IBC), from Peru; Ecolex, from Ecuador; Community Assistance in Development (COMAID), from Cameroon; Tanzania Natural Resources Forum (TNRF), from Tanzania; and the Indonesia Community Mapping Network (JKPP), from Indonesia.